[Image: From “Lower East Side Quarry” by Rebecca Fode; open each image in a new tab for a larger view]. Last month, several students from the Bartlett School of Architecture—studying as part of Unit 11, taught by Mark Smout, Laura Allen, and Kyle Buchanan—came through town for some field trips, workshops, and crits. At a public event in January, we looked at a huge range of work by all of the visiting students, and a number of the projects—all of them speculative works set in New York City—continue to come to mind. But because of the frequency with which I refer to one of them, in particular, I thought I should post it here. [Image: From “L.E.S. Quarry” by Rebecca Fode]. For a project called “Lower East Side Quarry,” Rebbeca Fode outlines an elaborate scenario in which the mineral content of the bedrock beneath Manhattan begins to exceed the exchange value of the real estate built upon it; accordingly, sensing access to untold wealth, residents of a rent-controlled street on the Lower East Side band together to form a rogue mining union. [Image: Map of Manhattan bedrock, courtesy of the USGS; view larger]. And downward they go, like economically motivated cousins of London’s Mole Man, expanding their cellars beneath the streets with this mythic quarry, beginning in 2012 at a location on Orchard Street, between Broome and Grand; here’s a map. [Images: From “L.E.S. Quarry” by Rebecca Fode]. Gradually, over time, the unlicensed and increasingly complicated mineworks expand beneath nearly every building in the neighborhood, following two veins of Inwood Marble that track north-south under the city; the buildings, in turn, are propped up by retaining walls and gantries as the quarry swells below. The ground plane thus drops lower and lower each year as the buildings themselves are, in effect, severed from the earth’s surface, coming to stand like circus acrobats on stilts over a neighborhood long ago overlooked—or underlooked?—for the mineral wealth in its foundations. While the project is a narrative scenario, not a real proposal for an emerging DIY extraction industry, it nonetheless presents an interesting question about mineral rights and the exchange value of geology in a major inhabited area. 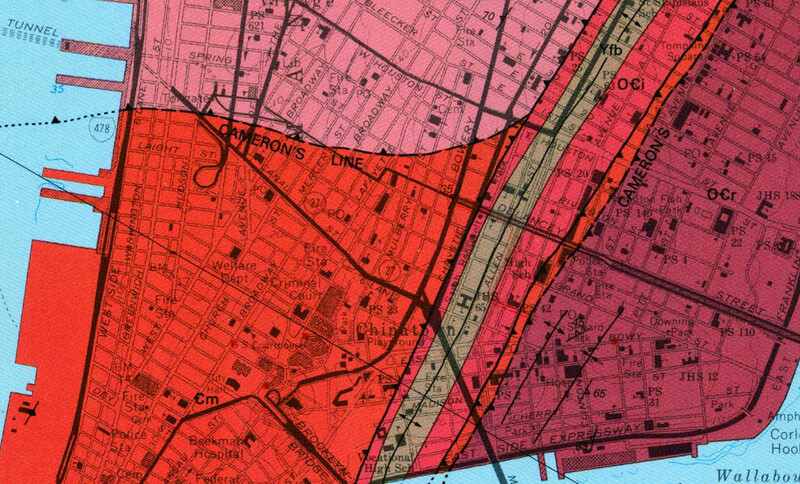 Should a valuable mineral resource of any exploitable extent be discovered down there in the veins beneath New York City, for instance, could mining become a viable use of the city’s real estate—and, more to the point, what would be the architectural effects of this radical subtraction of the ground plane? The city of Johannesburg springs to mind. 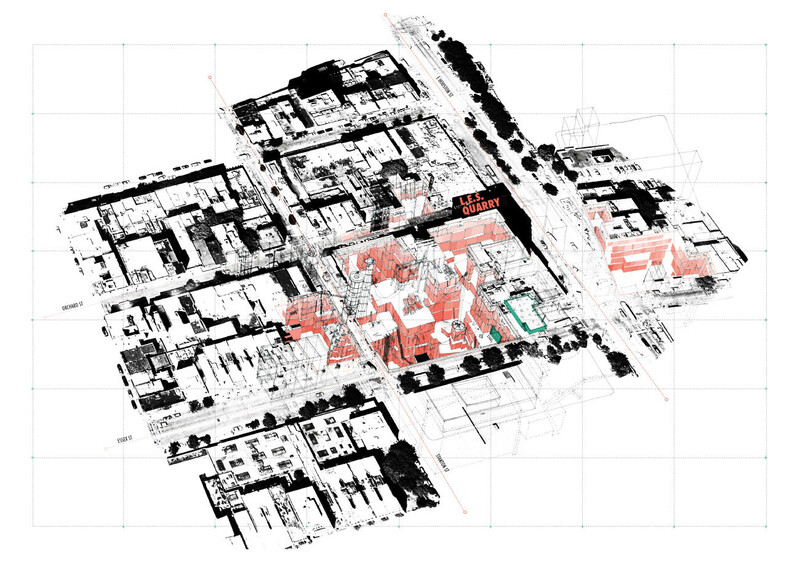 A recent graduate thesis project by Dorothy Tang, at Harvard’s GSD, explored the urban mines that dot Johannesburg’s densely populated landscape (some of the mines have even been hijacked and, later, raided by underground security forces), and Mario Gooden‘s current studio at Columbia’s GSAPP also takes Johannesburg’s porous, unevenly excavated urban fabric as its site. But what about the bedrock of Manhattan, an island often described in terms of canyons and analyzed as a geologic city? What happens when New York becomes a site of extraordinary excavation and it begins to expand not through fabulous skyscrapers but through sinuous and labyrinthine mines? What happens when mineral rights become as salable as air rights, when the geologic underpinnings of the city can change hands in a heartbeat, always on the verge of being extracted? [Image: Canada’s Diavik diamond mine via Wikipedia]. New York could become not unlike Canada’s extraordinary Diavik diamond mine, a hole seemingly in the middle of nowhere with water on all sides, but with some historic neighborhoods, art museums, stock exchanges, and jazz bars propped up above on a numbered grid of bridges shaped like streets. Some of those "sketches" seem very Lebbeus Woods (esque). All hanging, like off of a cliff. "What happens when New York becomes a site of extraordinary excavation and it begins to expand not through fabulous skyscrapers but through sinuous and labyrinthine mines?" Large mining companies in and around JHB provided rec clubs for their employees, particularly in less developed regions. As the son of a geologist I was constantly reprimanded by mother for spending entire days building dams in golf course streams flowing with polluted mine water. I'm 25 and awaiting my illness. A less extreme version could develop in Lincoln, Lincolnshire, England. A number of open spaces(school and college playing fields, sports clubs, allotments) in the City, and with homes close by in a densely popualted part of the City, are former or potential quarries that could provide the sandstone for repairs to the Cathedral (quite a famous example of gothic architecture) . The needs of the maintenance of the historic fabric of Cathedral are having to be balanced against the needs of the wider community – perhaps not quite as extreme as the theoretical example for New York, but an indication that this is a real issue across the world. The entire town of Kiruna, the northernmost town in Sweden, will be moved due to the iron ore mine below its current location. It's a town of roughly 18,000 inhabitants. The move will be several kilometers and will include moving substantial structures such as the city hall and church. This reminds me a lot about this story. There are a bunch of old quarries around Boston – not as interesting as the juxtaposition with skyscrapers in NYC, but here's one which is now a park. and there's another that's still in operation on the outskirts of the city – mostly stone dust now. I'm wondering what other cities have quarries that have been since built over – like Pittsburgh? I know Detroit has salt mines under the city.